It all started on a hot, hot night. I was out and about (eating of course) when I received a text from my good friend Laura asking if I could take that Friday off work. When I sent a message back asking what was on the agenda, she simply replied with… Private charter plane to Margaret River! And that is how only days later I found myself on a local adventure thanks to Qantas epiQure and Tourism WA. I love going to Margaret River. 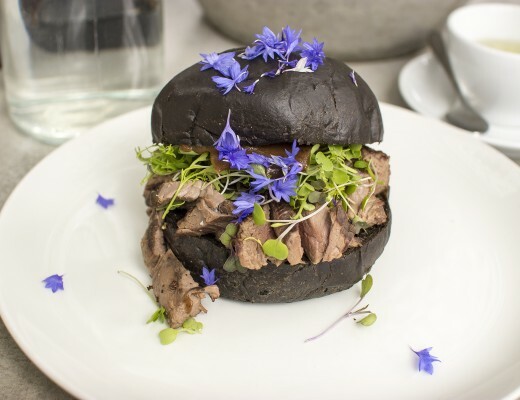 It’s a haven for Western Australians, a destination to proudly hang our hats upon that ticks the box both from a visual perspective and an incredible array of food and wine. 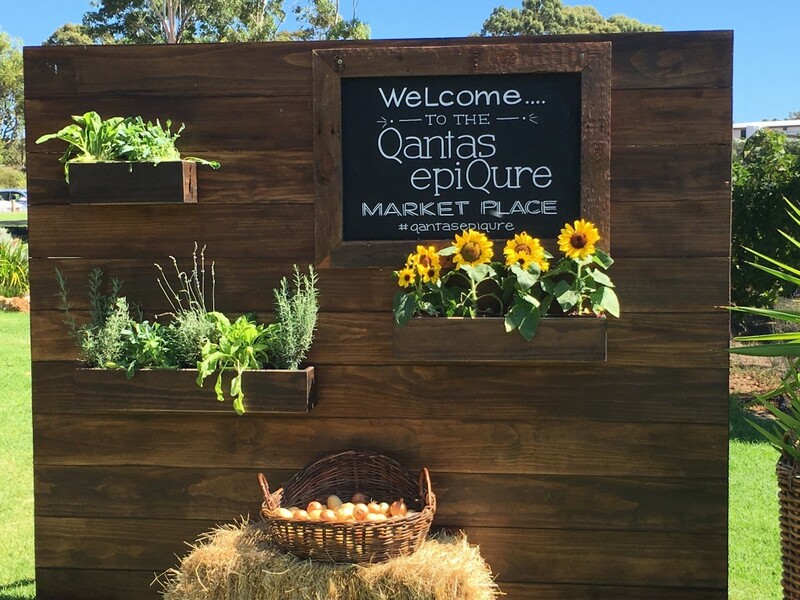 It’s no surprise that Qantas chose this location to celebrate the launch of their epiQure program expanding into food, with local producers from around Australia being selected to sell their products on board Qantas flights. Boarding the Qantas chartered flight at the domestic airport, it was easily the fastest flight I’ve ever taken in my life. 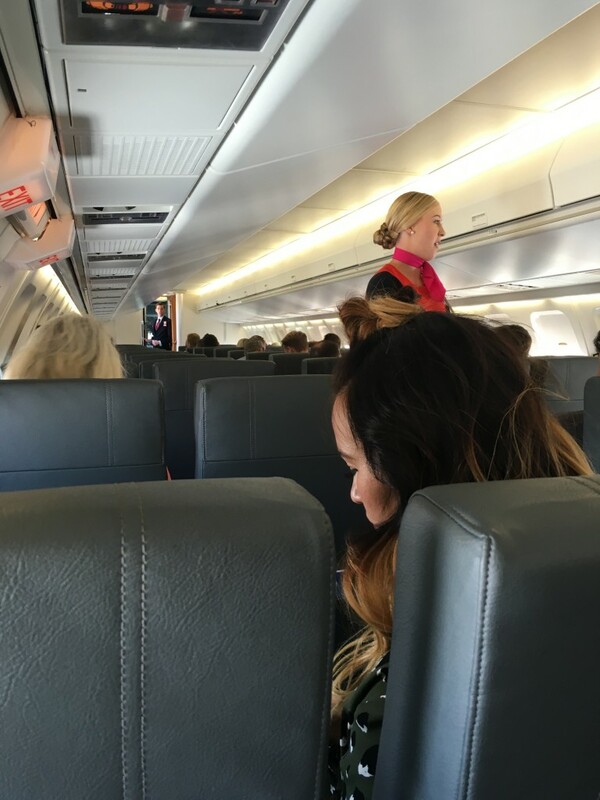 It basically felt like we boarded, watched the safety demonstration and then soon enough we were touching down in Busselton. Amazing! To think, all these years I’ve been road tripping south, when flying is such an easy alternative. And best of all it meant I could relax and enjoy the day without the worry of needing to drive. 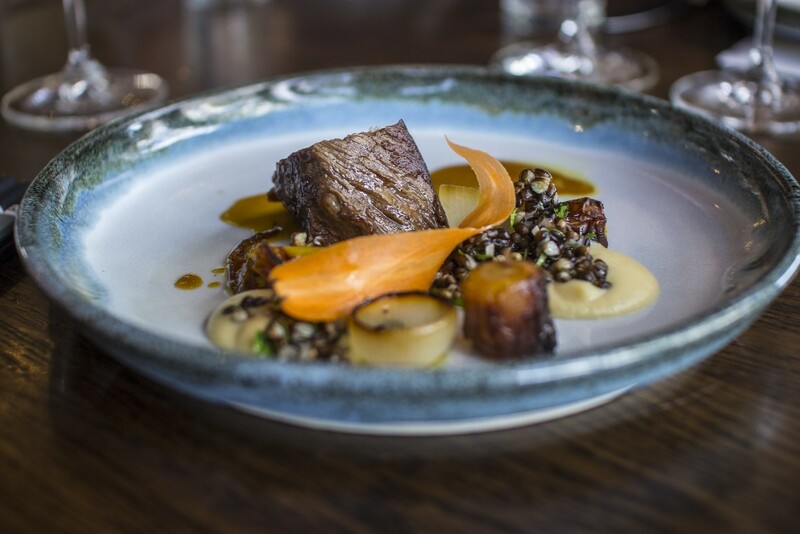 Joining with media, the Qantas and Tourism WA teams and selected Qantas frequent fliers, we were transported to the incredibly beautiful Vasse Felix, one of our states highest acclaimed wineries. 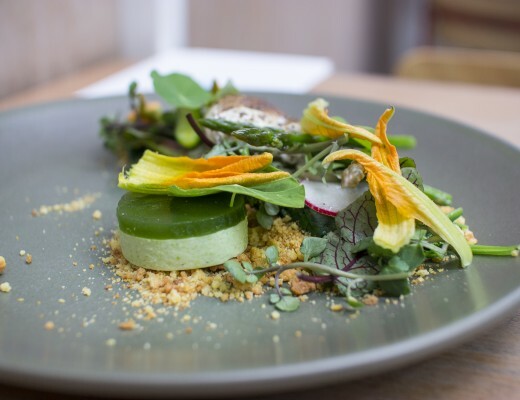 I was excited to eat the five course lunch we had planned there, as I’m a bit of an Aaron Carr fangirl, having followed his progression at the restaurant on site after working there for the last 20 years. 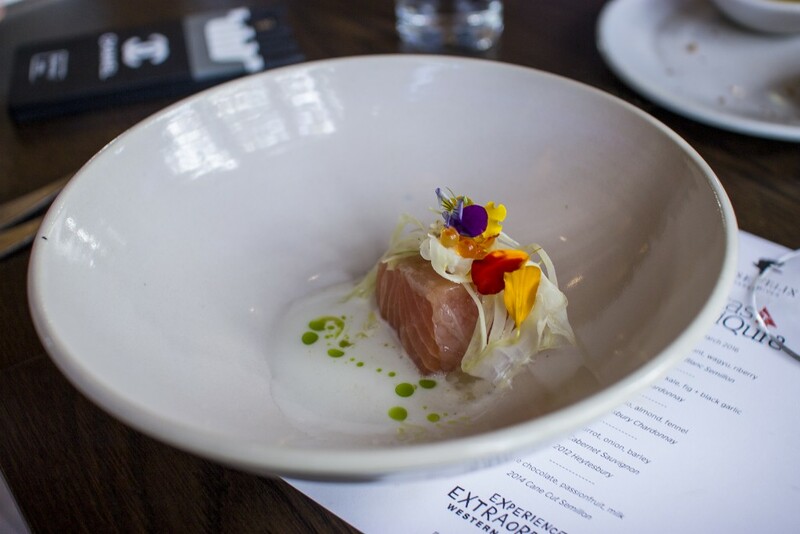 He came for the lifestyle and the surf, and his modern Australia fare has built him quite the reputation throughout the country. But before we sat down to enjoy the food, we indulged in a quick wine tasting with Chief Winemaker Virginia Willcock who impressed us all with her passion and her ballsy approach to wine – and also left me with a bit of a girl crush. My favourite quote of the day: “make something that respects your patch of environment, respects your patch of earth, instead of what people want”. With such an unabashed approach, it’s no wonder Vasse Felix wines have such an incredible reputation. Their wild fermentation process with no added yeast had created a gutsy range of wines. The mediterranean climate with marine influence has also had an impact on the flavour profile, which can explain why there is such a dedicated obsession with wines from this region. Moving into one of the rooms downstairs at the restaurant, we spent the next hour meeting the producers (some local and some from the eastern states) who have signed on to have their products sold on Qantas flights. 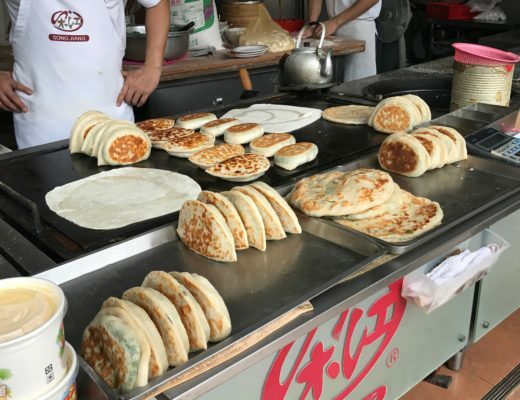 The range of gourmet delectables was immense and impressive, with something for everyone. Even though lunch was still to come, I must have eaten everything on offer – and then again and again. Everything was beautiful in it’s craftsmanship and quality, but there were definitely some standouts. 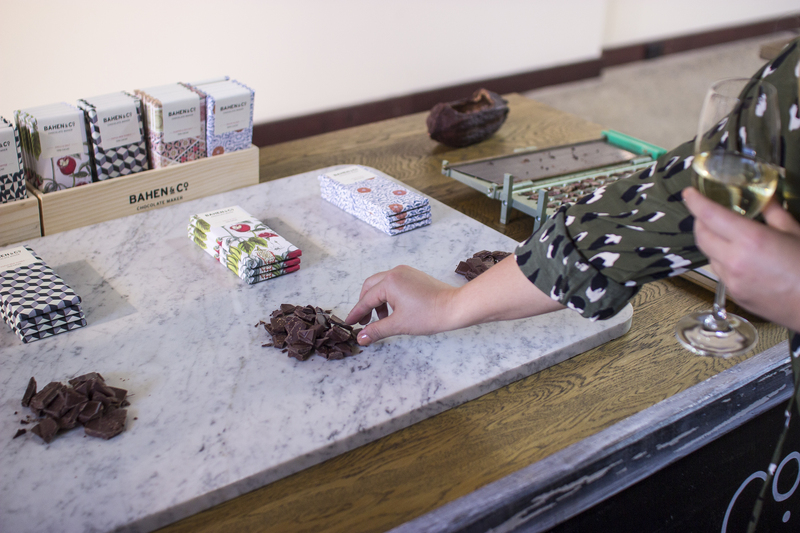 The Tasmanian Huon whisky cured cold smoked salmon, the Victorian Fudge and the Margaret River Bahen chocolate. 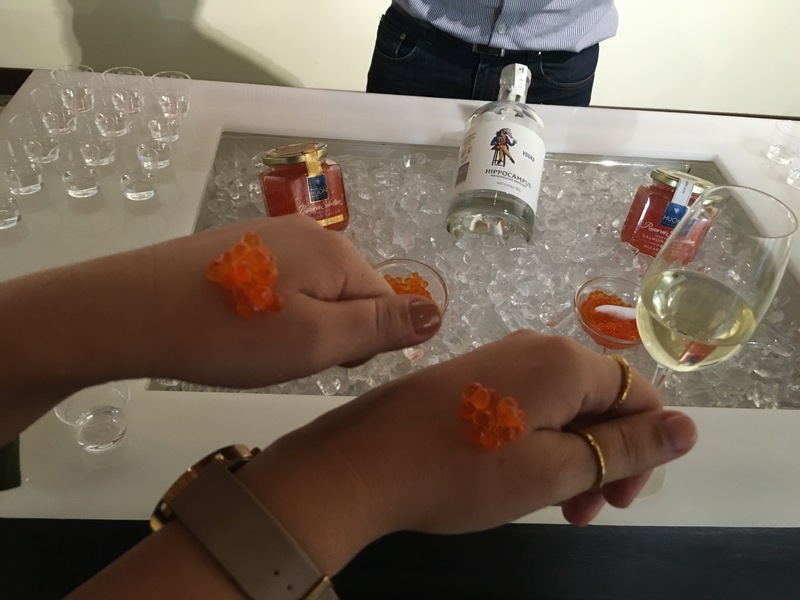 It was particularly fun to try salmon roe with a shot of Hippocampus vodka – apparently it’s how you clear your palate but for us it was almost like a gourmet (and delicious) drinking game. Once we’d sufficiently eaten our way through the epiQure market, we made our way upstairs to the gorgeous restaurant. It’s so organic in feel, with deeply hued timbers, big open windows and a view that I could definitely get used to seeing each day. It wasn’t long before the first course was served – and what an excellent introduction to Vasse Felix’s food, and to local produce for those visiting our state. 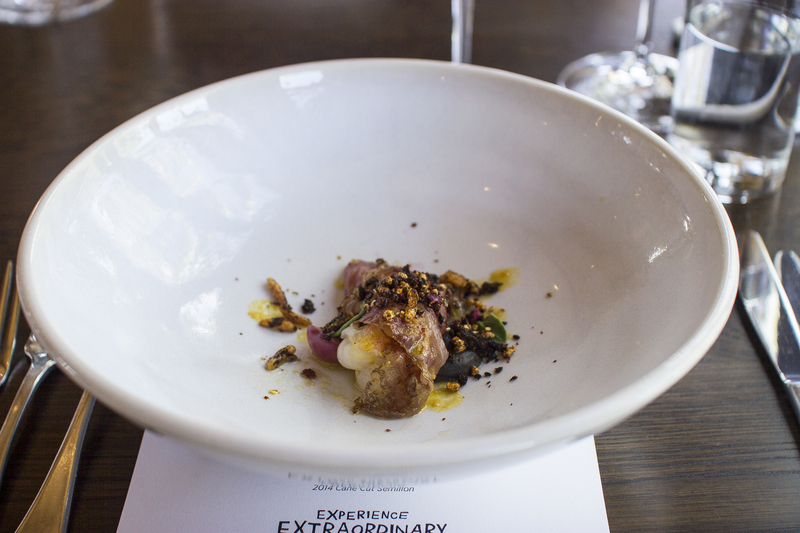 Marron, burnt eggplant, wagyu and riberry served with a 2015 Sauvignon Blanc Semillon. Wow. Marron is such an elegant crustacean and something every WA person can’t help but feel a sense of pride in that it is native to here. The delicate flesh was cooked perfectly, which I’m told is Chef Carr’s specialty, and I thought the translucently thin wagyu was an excellent addition to bring salt to counter the sweet meat. The burnt eggplant was something I never would have imagined to go with marron, and yet now I can’t imagine it without. Smoky, rich and just beautiful. A wonderful start to our meal, and well paired with the estate’s sweet SBS. 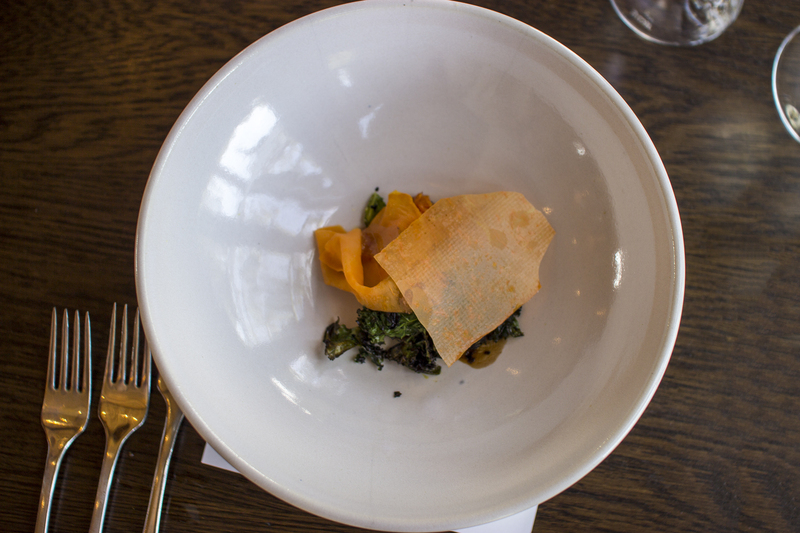 Our second course was ricotta with sweet potato, kale, fig and black garlic. Thin, crisp sheets of sweet potato hid the flavour bomb mound underneath, with the black garlic in particular having a ridiculous punchiness. 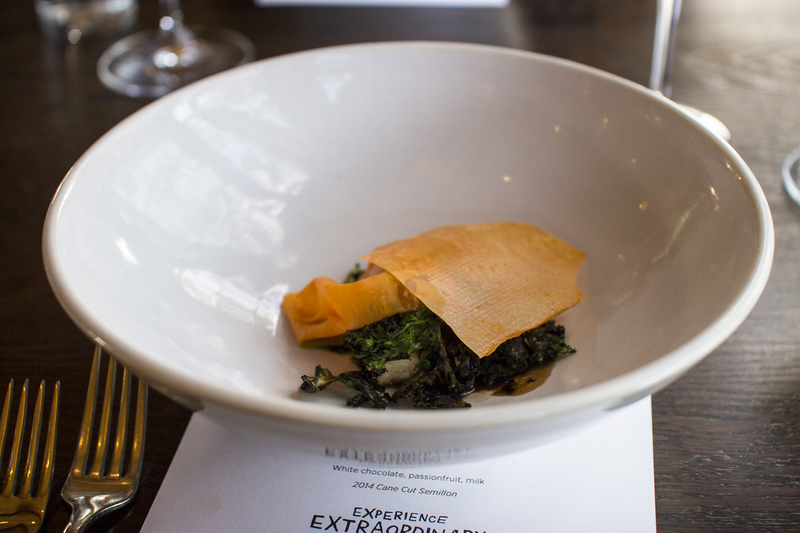 I really liked the crunchy pieces of kale which were particularly well seasoned. 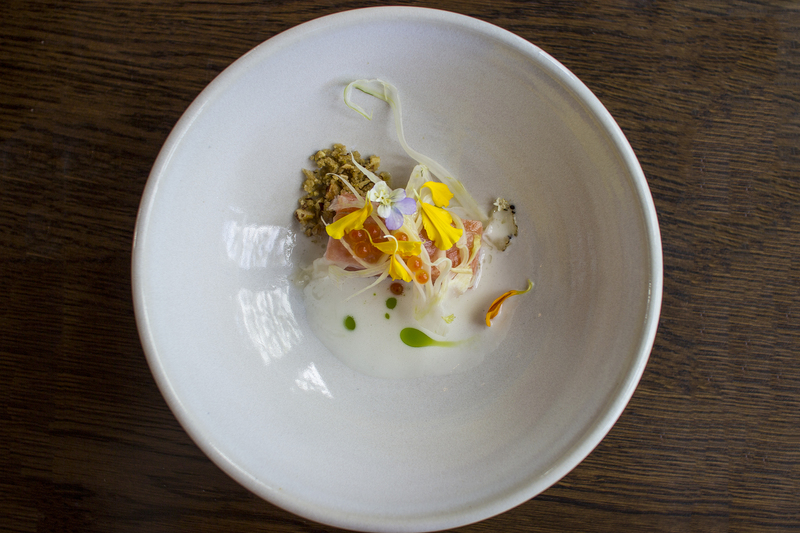 With this course we enjoyed a glass of the 2014 Chardonnay, which was bright and elegant. A wonderful lunchtime wine I thought! 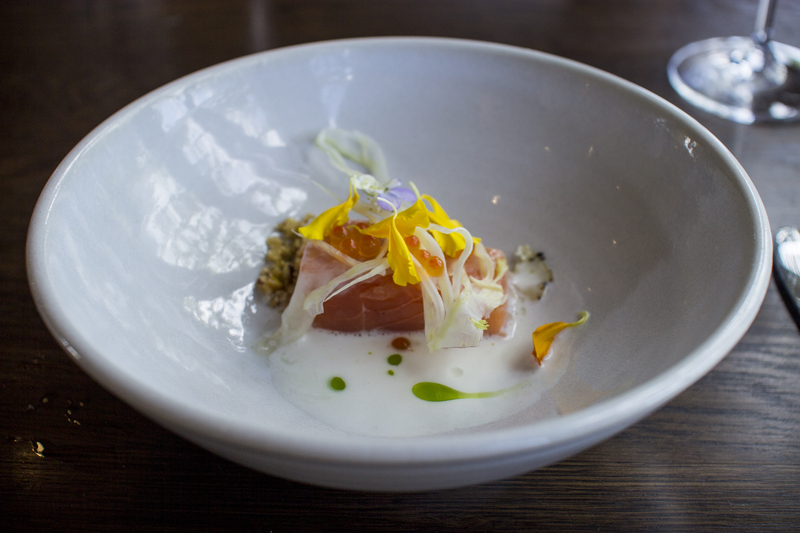 Our third course for our lunch was the salmon with lardo, almond and fennel. 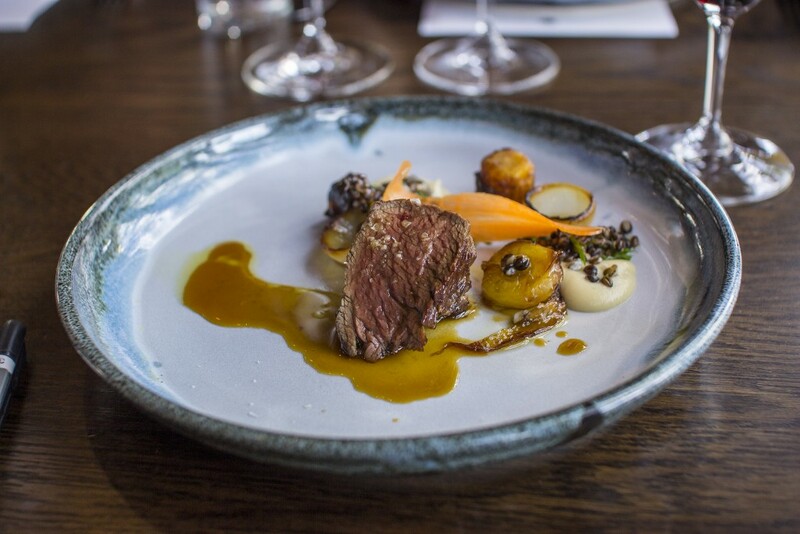 A beautifully plated dish, it was a real standout for me in the lunch – especially with the accompanying 2014 Heytesbury Chardonnay. The salmon was cooked rare, the flesh flaking gently and the inside ruby pink. Summery, vibrant and morish, I really didn’t want this course to end. It was a great example of seafood executed on the money. 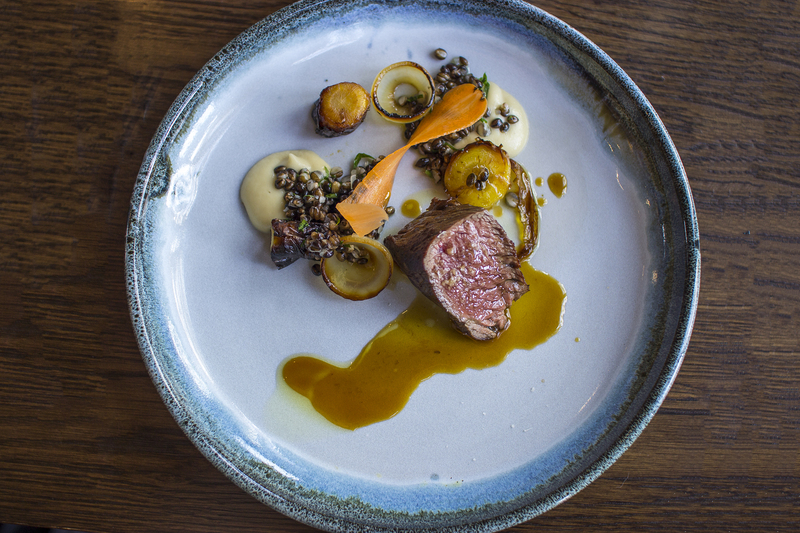 The final savoury course was the beef with carrot, onion and barley. Another small plate, this one was really quite filling! The beef medium-rare and well rested, the onion soft and sweet. 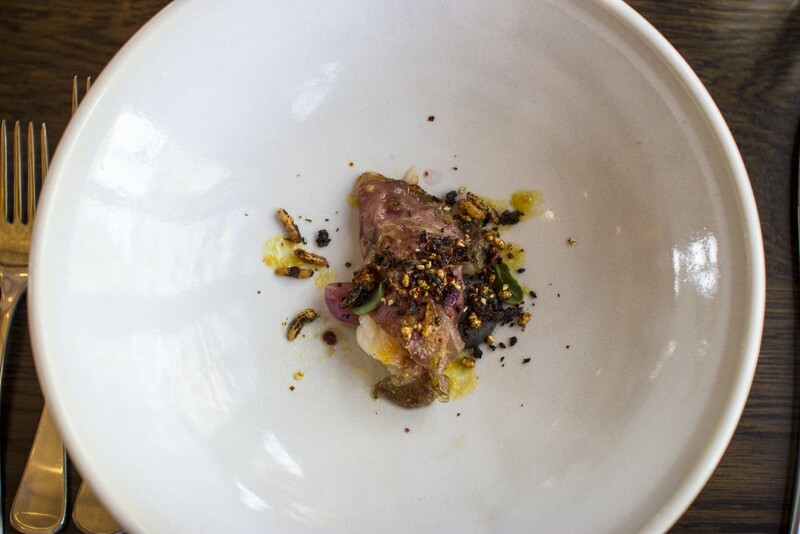 I love barley, and really thought that the addition added so much to this dish, making it a standout. While my favourite course was the first, closely followed by the salmon, the beef was quite the popular dish for those around me. 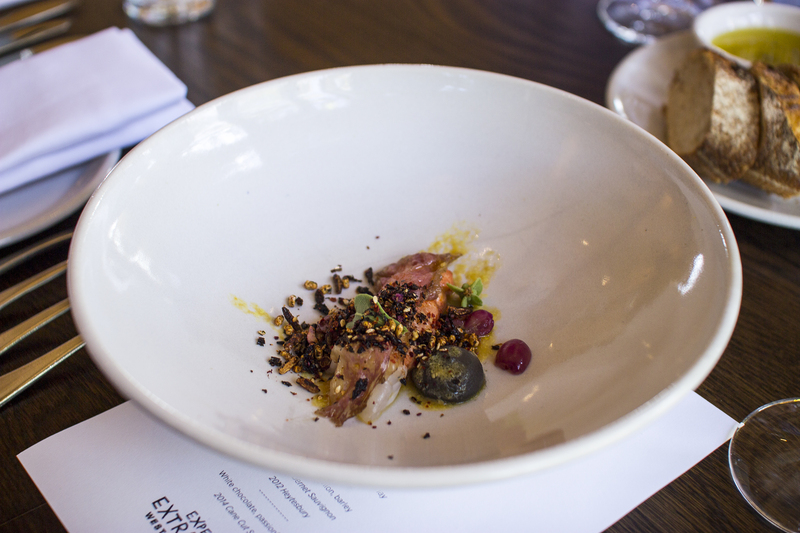 We were fortunate enough to enjoy this with two different glasses of wine – the 2013 Cabernet Sauvignon and the 2012 Heytesbury. The latter in particular was phenomenal, a wine I haven’t tried before and will definitely be seeking out again in the future. Unique to Vasse Felix, this wine is one known as marking a significant evolution in their winemaking and I can see why. 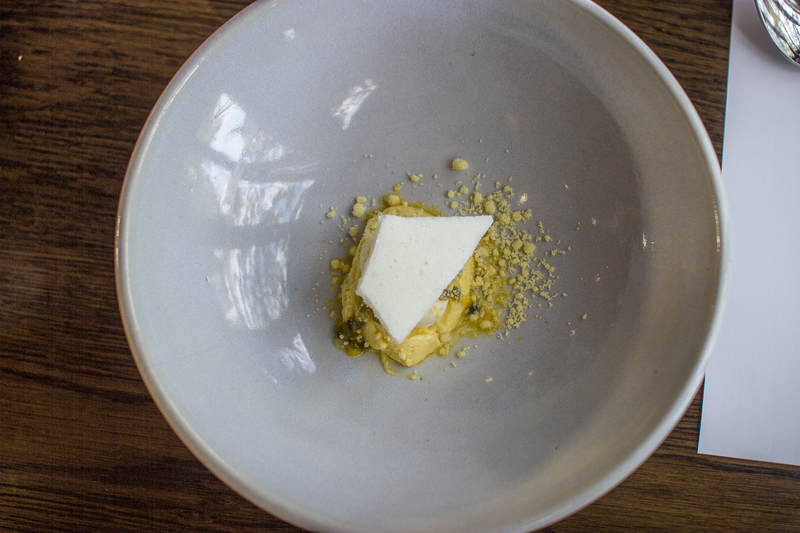 Our final dish before we were whisked away back to the airport to return to Perth was white chocolate with passionfruit and milk, and a sweet glass of 2014 Cane Cut Semillon. 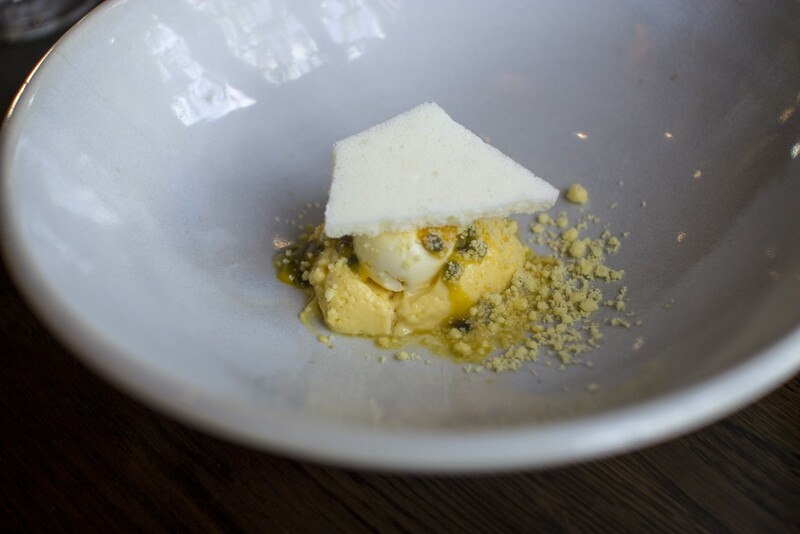 What an elegant way to finish our meal – intense, tropical passionfruit mousse that bordered the line of sweet and sour, wit the crumbs and a layer of white chocolate meringue. It looked so simple on the plate but it was mouthfuls of tangy goodness. And a wonderful taste to savour as we made our way home (and while you’d think we would be SO full, Laura and I may have made our way to Mary’s when we landed to kick on our eating – after all, there were only a few days left sadly before it closed it’s doors). What a way to spend a Friday and lead into the weekend! The entire day was something to be savoured, and a new experience in visiting Margaret River than I have been involved in before. Thank you Laura, Tourism WA and Qantas for what was a truly special way to celebrate epiQure, local producers and the southern region we’re so proud to call part of WA.